Nike Training Club is now available on the Apple Watch, as part of a free update to the existing iPhone app released today. The personal training tool offers more than 180 free workouts, ranging from strength and endurance to mobility and yoga, with expertise from Nike trainers and sponsored athletes like Cristiano Ronaldo and Serena Williams. Workouts can be started in the iPhone app, and then the Apple Watch app allows users to easily check the amount of time or reps remaining for a drill. 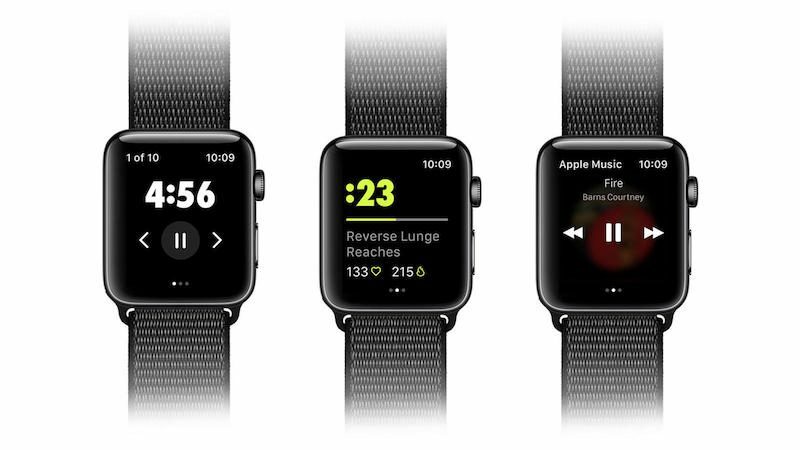 Apple Watch wearers will also receive haptic feedback during workouts. Nike Training Club, free on the App Store, requires iOS 11 or later on iPhone and watchOS 4 or later on Apple Watch. Am I missing where all of my runs are? Exactly! You used to be able to Log on and see your run graph etc, did all that go away ? Aha reading ftaok's post answers that question - Bloody Marvelous! You're correct. The NRC website is useless. All of your activity which use to reside on the website is now only accessible via the app. It's really a joke what Nike has done to their system. Their first running app was great and now it's just a buggy mess that brute forces marketing and their athletes down your throat. I'm sure this Nike Training thing will be more of the same, then abandoned a few years later. Here's a history of Nike's recent fitness systems. Hmm...I've been having terrible trouble with their NRC watch app...seems so strange to me that Nike has been marching forward with their apps while I can't get their running app to reliably record a run. Anyone else having a similar experience? I'll pass. I just moved away from NRC when they shut down their website. Hmf. Another suggestion for a soft spelt of colours in a workout app that requires its iPhone component to be running (negating concern for display timeout lock from working as that should). I'm looking for something that has fat-burning exercises as well (which is one of the reasons I chose Keep). I am really surprised by some replies. My NRC and NTC are accurately collecting all the data. Maps are stored on my phone, workouts are stored and i can access everything via the corresponding apps. NRC has always tracked heart rate and now NTC does so as well. Only occasionally I experience a run completely shut off when I have completed it. However, in most cases, the run appears on my phone after only a few minutes. If the Nike apps work well for you, that's great. There are a bunch of folks on here where the Nike apps worked well for them as well, up until the time that they stopped working well for them. In my case, the major problems started last fall (October 2017) with the introduction of the S3 Nike watch. Whatever they did to the app to accommodate the S3, killed it for me and my S2. Problems ranged from little stuff like having to wait 10 seconds or so after hitting start for the app to actually start. Inconsistent mileage markers on the map when viewed on the iPhone app (interestingly, the maps on the website were accurate). Seemingly random crashes. etc. I switched to another running app and haven't looked back. I still log my data to NRC so that I don't lose all of the miles and stuff, but even that is less and less interesting. Especially if the only place to look at the data is on my tiny 4.3" screen. Many of us long-time Nike users remember the older apps that were fast, accurate and bullet-proof reliably. Unfortunately, those days are gone at Nike. What have you been using instead? I have been tired of it since they did the major update. Confusing. This app can’t be used without the iPhone as well. Just using the built in Workouts app for the time being. Good enough for now. I switch platforms every year or two. Correct. All of your running data is now gone from the website. You can no longer access it with a browser. The only way you can see your data is to use the NRC app, only available for iOS and Android. If you use another platform, oh well.